Having finally given in to pressure to produce a sweeter cider, 'The Medium One', a traditionally made medium cider, was trialled in 2012. 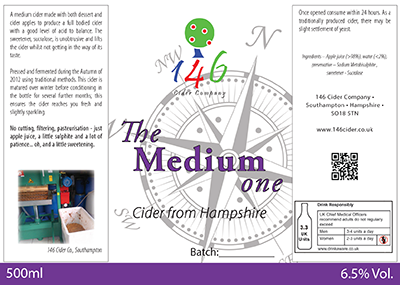 Blended from 50% dessert apples and 50% cider varieties, this cider was created in the Hampshire style and had both acid and tannin with a fruity flavour. The sweetening, by sucralose, rounded off any roughness at the edges - both tannin and acid were more tamed and soft. The fruit for The Medium One came from both Hill Farm in Hampshire and from Rogers Orchards in Dorset.